A mainly 14th and 15th century building with many earlier features, like 13th century doors and south chapel. It's a funny looking place from the outside, particularly the stunted octagonal tower and the bizarre Neo-Gothic porch with huge pinnacles, only put up in the 1860s. The top of the tower was taken down in 1810 and replaced with a rather nice wooden lantern, but this went during the disastrous fire of 1893 when the whole place gutted. Fortunately, it has been well restored, including the fascinating monuments which were seriously damaged. The main monument of note is that to John Golafre, cousin of Richard II's great friend of the same name. He lived in the adjoining manor house and was a soldier, minor Royal official and Keeper of Woodstock Park in Oxfordshire. He died in 1442, having built the north chapel of Fyfield Church as his mausoleum. His monument there was constructed in the popular style of the time, having two tiers with an effigy of the sleeping deceased in armour above his rotting corpse. This is the only example still to be seen in Berkshire. Edward IV had planned a similar monument to himself at St. George's Chapel in Windsor Castle, but it was never finished. There are heraldic ledger stones to the White family, relatives of the founder of St. John's College, Oxford, and shields of the Perrot family, perhaps part of a lost monument. In the chancel is a large framed Tudor wall monument enclosing a lost brass of a lady and gentleman, kneeling in prayer. The female figure was Lady Catherine Gordon, sometime wife of the infamous pretender to Henry VII's throne, Perkin Warbeck. Presumably the male figure was her fourth husband, Christopher Ashton. They live at Fyfield Manor. There is a nice Early English sedilia and piscina, and, over the altar is fascinating 14th century stone reliquary with an openwork tabernacle recently restored in wood. Who did the relic come from? St. Nicholas perhaps. This is not the official Fyfield Church website. Please do NOT mail me about use of the church. Visit the C of E's Church Near You website instead. © Nash Ford Publishing 2001. All Rights Reserved. 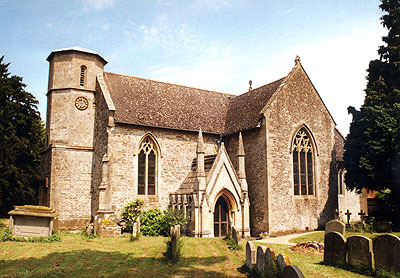 The location of this church is now administered by Oxfordshire County Council.